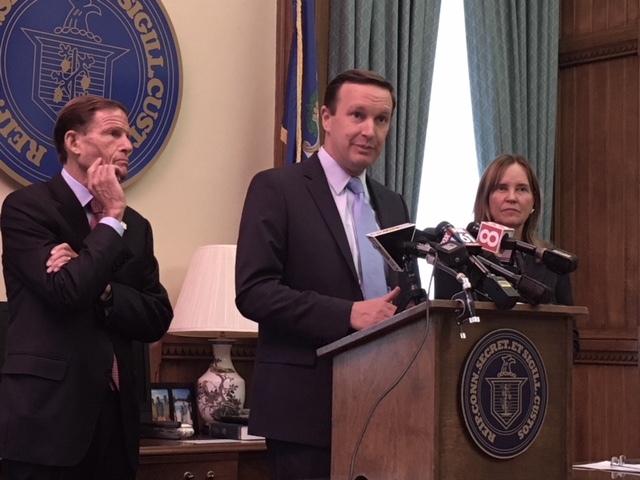 From left, Richard Blumenthal, Chris Murphy and Denise Merrill. Connecticut’s secretary of the state and two U.S. senators said Monday that Russian attempts to influence U.S. elections are real, but that the state’s counting and reporting of results are conducted off line and therefore resistant to hacking. “In Connecticut, our voting machines are never connected to the internet. This is not about the ways your votes are tabulated,” said Secretary of the State Denise Merrill. Merrill and U.S. Sens. Chris Murphy and Richard Blumenthal said Russians continue to try to gain entry to U.S. government computer systems and influence elections by varying means, including social media. Connecticut was one of 21 states identified by the Department of Homeland Security last year as targets of Russian hacking prior to the 2016 presidential election. They were stopped by security measures from gaining entrance into the state’s online voter registration system. The three elected officials, all Democrats, focused on cyber security at a press conference publicizing the receipt of a $5.1 million grant to upgrade the state’s elections infrastructure, with $1.8 million going to bolster security. But the grant program was created for a more mundane reason: Newer voting systems, which rely on electronic technology, need to be updated more frequently than mechanical voting machines. Connecticut upgraded its system in 2006, discontinuing use of its mechanical vote-by-lever machines in favor a hybrid system of old and new — paper ballots tabulated by optical scanners. The state considered and rejected ATM-style machines that left no paper trails for recounts. No system is immune to security breaches, but corrupting the state’s tabulation system would require gaining access to computer chips used to program the tabulators in all 169 cities and towns. States were pushed to upgrade their voting systems after the Florida ballot-counting controversy in the 2000 presidential election. Under the terms of HAVA, the Help Americans Vote Act, Congress provided funding for states to modernize their voting machines and strengthen election administration. The new generation of voting machines are no longer so new, and breakdowns and malfunctions have become more frequent. Thirty-three states say they will need to replace their machines before 2020, according to a survey by the Brennan Center for Justice. With $1.1 million of the grant money, Connecticut is buying 169 additional optical scan tabulators as backups, but even those machines are flirting with obsolescence: The Accu-Vote tabulators used in Connecticut have not been manufactured since 2007. The additional machines are previously owned. Elections security has been politically fraught. There generally has been bipartisan support in Congress for funding of election infrastructure — the Connecticut grant is from $386 million appropriated by Congress. But the issue of Russian interference has been a source of controversy for President Donald J. Trump. The president has downplayed and at times questioned the existence of the interference, but his national security officials flatly say Russia is guilty of numerous hacking attempts. “Our democracy is under siege,” Sen. Richard Blumenthal said. An effort to add $250 million in funding for election security was blocked last month by Senate Republicans. In the House, Republicans stopped a similar measure in July. The GOP said it was too soon to beef up funding without seeing how the $386 million was used. “I am a little worried that we are losing some of our bipartisan consensus around election protection,” Murphy said.